We spent a very pleasant long weekend as guests of Ruth and John, Kirsty’s in-laws, who live in a small village close to Liverpool. We toured extensively around the Liverpool area and some of the highlights were listening to their stories of growing up in Liverpool and driving through many places which they were able to link with their childhood memories, a tour of the WW2 Battle of the Atlantic HQ, still preserved pretty much as it was left in 1944, and visiting Lord Lever’s Sunlight village, Antony Gormley’s Another Place installation, Chinatown and the Church of England cathedral. We were on the go from the moment we touched down at the airport early Saturday morning, being whisked off for breakfast at a Turkish cafe, until the time we departed late on Monday night. 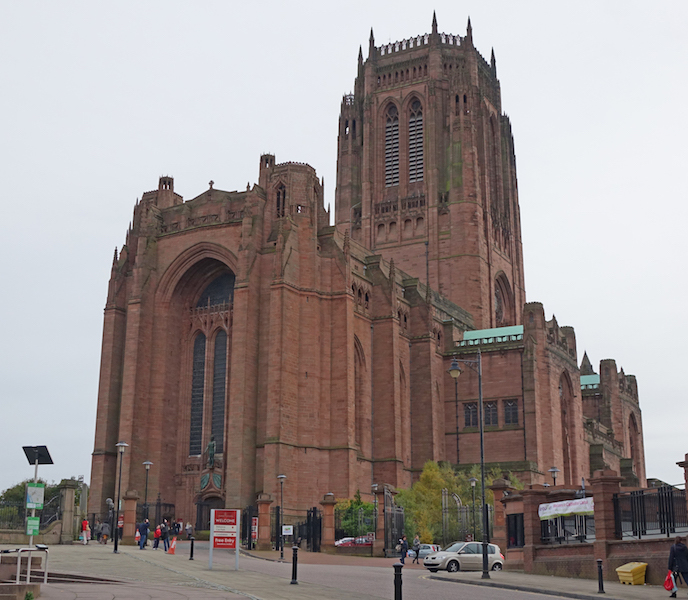 Liverpool Cathedral stands proudly on a high point of the city. It is a modern church, begun in the early 1900s and completed only in 1978, its claim to fame being that it is the longest cathedral in the world at 189 metres. A competition was held for architects to submit designs and the eventual winner was a 22 year old with no existing buildings to his credit. He apparently told the committee that his previous major assignment had been to design a pipe rack! It’s a magnificent building and well worth a visit. The thing which made our visit totally memorable was that someone began playing the pipe organ with a very creditable performance of Widor’s Toccata and I was able to get much of it videoed. I was a bit worried about file size so I did it in three separate clips which I have now put together and loaded to Youtube. It’s hardly a triumph of the videographer’s art but it does record the sound of that stirring music very well as well as giving some indication of the interior of the cathedral. If you have spare 4 minutes or so, listen to it on the link below. On the way through, keep an eye out for a pink-coat-wearing Pip here and there. Also, some way through, someone comes along and starts fiddling with the organ stops behind the organist’s back. However, it’s not as bad as it seems because he is the cathedral’s organist, Ian Tracey, and we surmise that the player is someone unfamiliar with the stops. And that’s not surprising as it has over 100 stops across 5 manuals (keyboards). What a great experience – videographer’s expertise fine despite the deprecating intro on your blog!! The catherdral is magnificent – amazing considering it is so modern, and designed by someone of such a young age and presumably limited experience, despite the pipe rack design success. I have been to the cathedral – but did not have the pleasure of the organ accompaniment for my visit, you were fortunate.